FRIDAY SEPT 8th-16TH, 2016 ! SACRED LAND~SACRED SOUND: We will learn how to connect to the Elementals around us, merge with the spirits of the land, following the trails of the ancient mystics, by keeping our main emphasis on the frequencies of the heart. and by expanding ourselves with the awareness of the subtle sound. We will be opening the sacred space and energies left behind by the Cathars, the alchemists, and the living spirits of the Saintes Maries. We will find ourselves accompanied by a Divine Feminine Presence of Mary Magdalene, constantly watching over us and our Sacred pilgrimage. With great awareness, we’ll let ourselves be tuned to the frequencies of the land, we will expand our ears to the music of the spheres, and literally become tuning forks vibrating in resonance with the energies around us. With the Himalayan bowls, the crystal bowls and tuning forks we will enter a deep meditation exploring the subtle realm of paraliminal frequencies that hover just within the range of hearing. Feeling vs hearing the sounds and silences, within and without. With most sensitive listening we will develop our “3rd ear” located in the center of our heart, to truly rise above and embody our multidimensional self. There will also be plenty of space for laughter, sharing beautiful “soul” food and local wine spirits. Time alone and time to rejuvenate our soul, body, and spirit will also be honored and encouraged! Sound Healing / Sonotherapy / Sound Healing Meditation. Holding space with the focus on Sound Awareness and unheard frequencies. Working with the elemental Spirits (consciousness) and lay line & key-points of the land. Listen & “Sound Bless” the living frequencies of the Earth, Wind, Water and Fire. Learning and sending Sound Prayers using lay line currents (kundalini energy of the planet). Receive at least one private session of sound healing resonating to a specific sacred site. Our Guide Philippe. 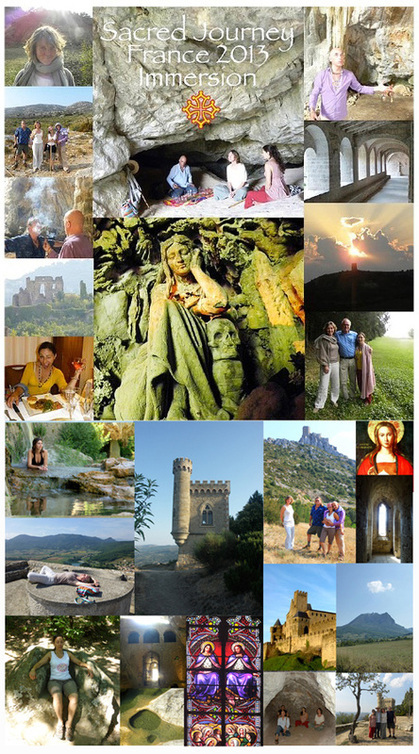 This Sacred Sound Journey & Immersion Retreat in the heart of the Cathars Country is lead by Philippe Garnier co-owner and director of Sage Academy Of Sound Energy~ Center for The Healing Arts in Woodstock, New York. Philippe shares his knowledge on his native land & expertise in Sound Energy. Our Refuge… La Source -Les Labadous is a very special place. It means washing place or cleansing place in the Occitan language. A place with a special energy. A healing energy and a creative energy. The energy of Mary Magdalene. The woman, they say, who lived here and preached here. La Source is now a “Domaine des Amis”, a house for friends. It is situated in the valley south of Rennes-le-Chateau, along the River of Colors, bordered by huge black poplar trees. Day one… Friday, Aug 1st Arrival and relaxation, getting acquainted with the magic of the retreat center Les Labadous-la Source. Late Lunch at Le Jardin de Marie in the center of Rennes Le Chateau. Yoga restorative and group sound healing to ease the jet lag and resonate with our new location prior to our dinner at La Source. Day two… Saturday, Aug 2nd After a well rested night, depart for Labyrinthe Vert de Nebias, and picnic lunch. Afternoon at the castle Puivert. Dinner back at La Source. Day three… Sunday, Aug 3rd Market at Esperanza in the morning, then depart for the Bélesta Church pray to the Vierge Noire (Black Madonna) and cleanse from the centuries old healing water source down the church. Early afternoon depart for the initiation caves of the Cathars for sound ceremony and healing. Late afternoon Notre Dame De Sabat to visit another Vierge Noire (black madonna). Dinner at La Source. 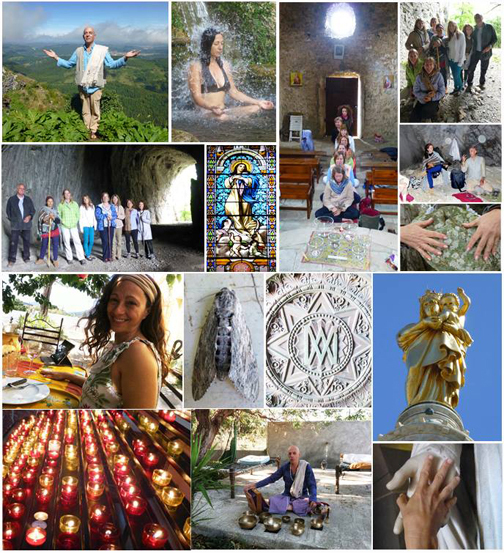 Day four… Monday, Aug 4th Morning, Journey to Montségur, Sound Healing practice & Cathars immersion with our guide. Sound Prayers & Meditation (Picnic). The climb is worth it to feel the energy of what has been left in the earth here. The Cathars lived and worked with the natural world and Light. They revered the Feminine, and could choose to become ‘parfaits’ or ‘pure ones’ if they wished. In the village of Monségur is a little church with a tiny Black Madonna and a Cathar museum. Dinner at La Source. Day five… Tuesday, Aug 5th After breakfast Alet les Bains Church, St. Salvayre Church and Standing Stones (Megalith). Meditation at the Angel Sanctuary Center. Lunch in Rennes les Bains. Afternoon rejuvenation and healing at Rennes les Bains. Hot baths, hot springs. The ley lines of Rennes Les Bains harnessed through the Seat of Isis, and the standing stones nearby, this area is surrounded by magical earth energies and there is a reminiscence of Celtic/Druid history here, surrounded with megalithic architecture. We will journey to experience the 3 seats. Long long ago people cared enough about this place to carve seats into two large granite boulders, and to honor a spring flowing from the hillside. It would have been a place for ceremony, for celebration, for acknowledging nature. We will visit the Fontaine Des Amours & the Source of Madeleine (Magdalene’s well), a Knights Templar initiation site. To complete the day we will drove to the hot baths, stripping off by the river, clambering across the stoney causeway, to rest in a pool filled with ever-flowing hot water. (shopping at Yoke’s store in Quillan on our way back). Dinner back at La Source. Group Sound Healing. Day seven… Thursday, Aug 7th Breakfast and early depart to Carcassone and Paris/Toulouse.